Charles Martin Loeffler (1861-1935) was born in Germany (though he always falsly claimed French origins) . He emigrated to the United States in 1881 having studied violin in Germany and France, and after some time as a player with the Boston Symphony Orchestra resigned in order to become a full-time composer. As a composer he was somewhat slow, though fastidious. The 1917 string quartet presented here is considered among his finest work. The 'Coolidge Quartet' of this recording appears to be a short-lived ensemble of first-rank musicians assembled by Elizabeth Coolidge for her tireless promotion of chamber music. Although the quartet existed in name for several years the membership seems to have changed regularly. Of particular note here is the composer, conductor and violinist Nicolai Berezowsky (1900-1953). Publisher's notes on this piece: "Music for Four Stringed Instruments was composed in 1917 at the height of the First World War and was dedicated to the memory of Victor Chapman, the son of a close friend and the first American airman killed in the conflict. Plainchant is used decisively in the structure of the work, the Resurrexi figuring prominently throughout the quartet. The Resurrexi becomes a secondary motif to the Victimae paschali in the second movement (subtitled “Easter Sunday”) but regains preeminence in the climactic third movement to affirm spiritual victory over earthly sorrow. A Lorraine march tune also appears briefly in the third movement, which is highly programmatic. Largely Impressionistic, the quartet also is infused with rich Romantic harmonies that reveal a cosmopolitan approach to compositional structure." Matrix numbers: 023442, 023443, 023444, 023445, 023446, 023447. Charles Martin Loeffler was a distinguished American composer and musician who was really French in his heart and soul. So French that he claimed and most of his biographies reported him to have been born in Mulhouse in Alsace-Lorraine, the provinces which the Germans captured in the Franco-Prussian War. Totally untrue. He was born in Berlin to a Republican father who was imprisoned for his activities in Bismarkian Prussia and was ill-treated, perhaps even tortured in prison, dying of a stroke when Charles was 12 years old. Charles conceived of a hatred for things German and embraced French culture. He emigrated to the United States in his 20's, but maintained his ties with France. He helped support Fauré in the latter's old age. His masterpiece is "A Pagan Poem" after an eclogue by Virgil. This has received a distinguished recording by Stokowski. Loeffler's "Mort de Tintageles" uses two violas d'amore in its scoring. The work in question here is a very lovely and elegant string quartet that is redolent of French style, but has its own distinctive voice. One hears Debussy and Franck, but there is a modal quality that is all Loeffler's own. The quartet is in three continuous movements which begin slowly and gain speed but never quite reach an allegro. Yet there is a sense of completion without the heavy rhetoric or thematic transformation of the Franckian school. 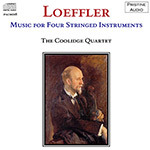 The Coolidge Quartet lives up to its reputation and the sound is neither cramped nor harsh.